38 October/November 2018 unmanned systems inside AIR SAFETY RESEARCH "We wanted to test to see if it could be con- trolled in four degrees of freedom, which is how a drone moves in aerospace," Valdenegro said. 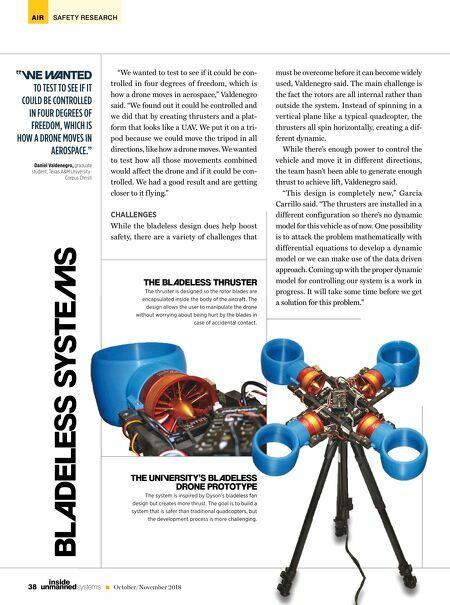 "We found out it could be controlled and we did that by creating thrusters and a plat- form that looks like a UAV. We put it on a tri- pod because we could move the tripod in all directions, like how a drone moves. We wanted to test how all those movements combined would affect the drone and if it could be con- trolled. We had a good result and are getting closer to it f lying." CHALLENGES While the bladeless design does help boost safety, there are a variety of challenges that THE BLADELESS THRUSTER The thruster is designed so the rotor blades are encapsulated inside the body of the aircraft. The design allows the user to manipulate the drone without worrying about being hurt by the blades in case of accidental contact. 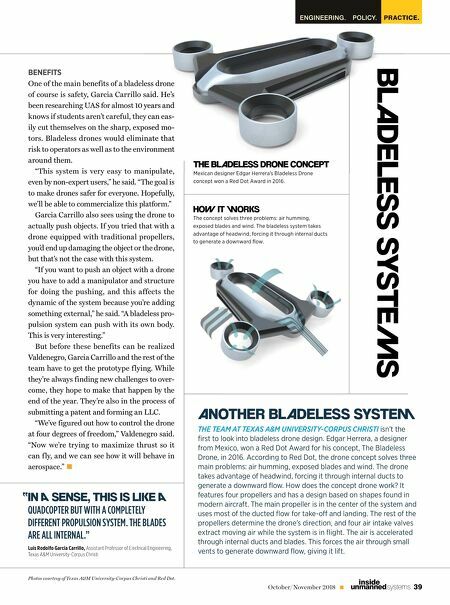 THE UNIVERSITY'S BLADELESS DRONE PROTOTYPE The system is inspired by Dyson's bladeless fan design but creates more thrust. The goal is to build a system that is safer than traditional quadcopters, but the development process is more challenging. must be overcome before it can become widely used, Valdenegro said. The main challenge is the fact the rotors are all internal rather than outside the system. Instead of spinning in a vertical plane like a typical quadcopter, the thrusters all spin horizontally, creating a dif- ferent dynamic. While there's enough power to control the vehicle and move it in different directions, the team hasn't been able to generate enough thrust to achieve lift, Valdenegro said. "This design is completely new," Garcia Carrillo said. "The thrusters are installed in a different configuration so there's no dynamic model for this vehicle as of now. One possibility is to attack the problem mathematically with differential equations to develop a dynamic model or we can make use of the data driven approach. Coming up with the proper dynamic model for controlling our system is a work in progress. It will take some time before we get a solution for this problem." "WE NTED TO TEST TO SEE IF IT COULD BE CONTROLLED IN FOUR DEGREES OF FREEDOM, WHICH IS HOW A DRONE MOVES IN AEROSPACE." Daniel Valdenegro, graduate student, Texas A&M University- Corpus Christi BLADELESS SYSTEMS THE UNIVERSITY'S BLADELESS DRONE PROTOTYPE The system is inspired by Dyson's bladeless fan design but creates more thrust. The goal is to build a system that is safer than traditional quadcopters, but the development process is more challenging. a solution for this problem." encapsulated inside the body of the aircraft. The design allows the user to manipulate the drone without worrying about being hurt by the blades in case of accidental contact.